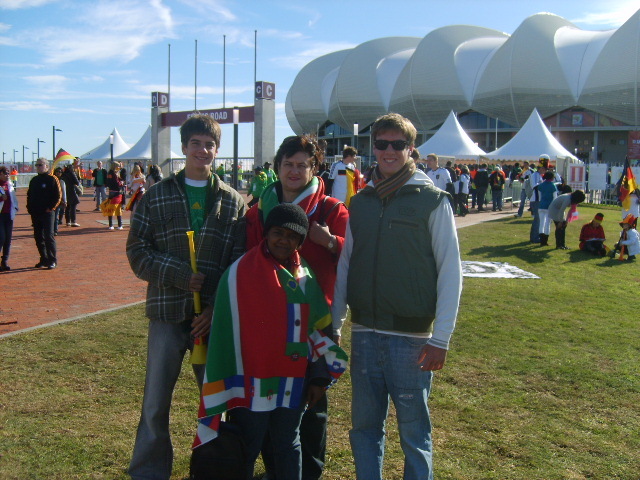 Five years ago to the day, we watched the opening game of the 2010 World Cup between Bafana Bafana and Mexico. We were at the Brazenhead in Stellenbosch where we watched the game played in Johannesburg on TV with hundreds of other Matie students. The “gees” was at an all-time high in the Land. Later that evening we drove through to the Peaches in Paarl where we spent the night. It was the start of a few weeks of a New South Africa. Was our hosting the World Cup rigged? What was the $10 million really for? Was it a bibe? And the legacy? Wonderful memories and costly stadia that are unused and falling apart. We are still paying for the party. The construction firms who built the stadia have been fined for collusion and price-fixing – they are paying for the party. Blatter and Valcke and the other top dog FIFA executives are the only ones who have been smiling all the way to the bank. Will they still pay for the party? 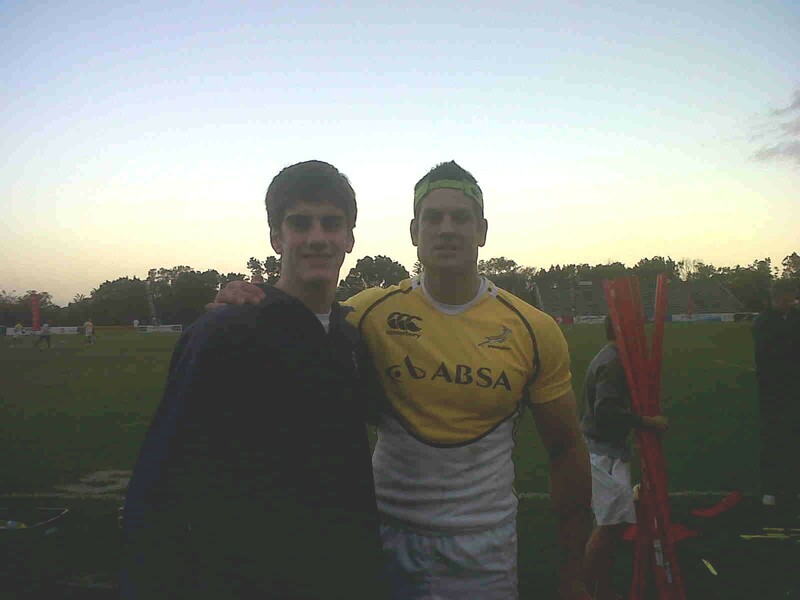 Some three weeks ago the name Joost van der Westhuizen was splashed across the media yet again. 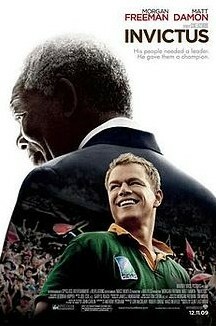 This time is was not because of his rugby deftness or because he had been the Springbok rugby captain, nor his being South Africa’s version (together with his ex-wife Amore Vittone) of Posh and Becks, nor his SuperSport appearances, nor his new range of clothing, nor his trysts and bedroom indiscretions. 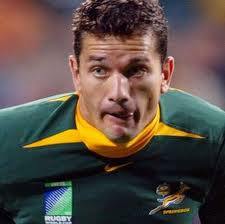 Unfortunately, Joost has been diagnosed with, what the media reports as, motor neurone disease (MND). Whilst it is sad that anyone is diagnosed with such an illness, I am pleased that the diagnosis in such a high profile person has suddenly raised so much awareness of these neurological problems. I have had numerous queries regarding this disease and how it relates to the corticalbasal degeneration (CBD) with which I have been diagnosed. Whilst I have no medical training, I will try my best to explain with the help of the reading that I have done since I became ill.
Motor neuron(e) diseases are a group of neurological diseases that selectively affect motor neurones, the cells that control voluntary muscle activity including walking, speaking, breathing, swallowing and general movement of the body. Forms of MND include amyotrophic lateral sclerosis (ALS), primary lateral sclerosis (PLS), progressive muscular atrophy (PMA) and Bulbar – but do not include spinobulbar muscular atrophy, spinal muscular atrophy, Charcot-Marie-Tooth disease (and many others). What makes it confusing is that theses diseases are often referred to by different names in different parts of the world and by different medical personnel and agencies. They also follow different courses in different patients. In the USA, MND is more commonly called amyotrophic lateral sclerosis (ALS), or Lou Gehrig’s disease, after the baseball player. Readers may be familiar with Morris Schwartz (of the book, movie and play “Tuesdays with Morrie” fame), diagnosed with ALS, and Professor Stephen Hawking, sometimes referred to as having ALS and sometimes MND. My disease, CBD, is also sometimes referred to (correctly or incorrectly) as being a motor neurone disease. Schwartz was diagnosed in his late sixties and told he had three to five years left to live – he lived for two more. Hawking was diagnosed in his early twenties – also given some few years, but is now 69 years old! What has become a talking point is “WHAT” causes these diseases and why they appear to be on the increase! Everyone seems to have expert opinion in this regard. To add fuel to the fire and to the skinder (gossip), this weekend’s press has reported on the use of steroids in South African high schools and rugby in particular. The dramatic headline reads “Steroid scourge rages in school rugby”. Ruben Kruger had a brain tumour, Andre Venter transverse myelitis (a disease of the spinal cord possibly brought on by disorders of the spinal blood vessels), Joost van der Westhuizen MND, Wium Basson liver cancer and Otto Krynauw brain haemorrhage. Googling steroids, I found that the use of steroids may lead to many health issues, inter alia, cardiovascular and liver problems. So there may be a link … or is there? According to my further reading on neurological illnesses, about 90% of cases of MND are “sporadic”, meaning that the patient has no family history of ALS and the case appears to have occurred with no known cause. Genetic factors are suspected to be important in determining an individual’s susceptibility to disease, and there is some weak evidence to suggest that onset may be “triggered” by as yet unknown environmental factors. The bottom line is that cause of illness is as yet unknown and there is currently no cure. Most cases of MND progress quite quickly and MND is typically fatal within two to five years (although we have seen that Hawking has lived for more than 40 years with the disease). And this seems to be the pattern with all neurological illnesses – as yet, no known cause and no known cure. So maybe a call for more research/investigation into the use of steroids is warranted. At the same time, maybe an investigation into school sport is warranted. One of the topics discussed at our recent reunion was the comparison between the size of players 25 years ago and their size today. I am of the opinion – controversially so – that, whilst there may be no direct correlation between the “nerve thing” and sport, we have definitely lost our minds when it comes to the position that sport and especially rugby takes in our educational system today. Steroids are used because too many hopes are placed on playing in first teams and on the need for them to win. There are too many teachers who coach and don’t teach, too many hours of school time used to organise, prepare and play, too many kilometres travelled on tours, too many “social” gatherings, too many nights in hotels, too many meals in restaurants, too many unaccounted for and hard-earned rands spent by sponsors and expected to be paid by parents, too many rands in “retainers” paid to school boys by franchises and unions – all in the name of rugby, of winning and of the supposed educational spin-offs that all these activities bring. There is, in my opinion, too much money and time spent on what has become our international professional sporting enterprise. 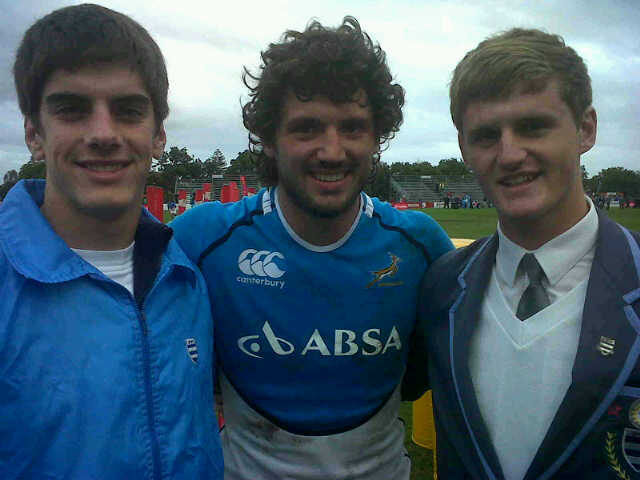 That’s why we have to pay R600 for a ticket to watch a game of rugby! And the process starts in our school system – in a country that can least afford such luxury and has one of the weakest educational systems in the world. In many (all?) cases, it’s the economic underpinning of the system that creates the root unhappiness. Yes, please, investigate steroids, and all the rest. It would also be interesting to investigate just how much money is spent on the research of neurological illnesses vis-a-vis that which is spent on rugby! In the meantime, each additional case of neurological illness, is too many – one too many! A month ago today, Friday 11 March 2011, Japan was hit by its strongest earthquake ever, followed by a devastating tsunami and then a nuclear disaster. Thousands of people were killed and many more missing – also presumed to have died. Today, it was struck by yet another large earthquake and a tsunami. In the interim there have been numerous other after-shocks. And all this time, I have not written anything. The reason for this is quite simple: My hands are becoming more difficult to hold up, my fingers becoming more rigid, sitting for periods of time becoming very uncomfortable (my left bum is numb most of the time!) and my mind becoming cloudier and overcast. It’s not exactly the best recipe for writing! Added to this, are the ongoing normal daily domestic, home and family issues that have to be attended to, and are sometimes more taxing than dealing with the CBD. The fact that Japan has had one major disaster does not preclude it from being subjected to many more. The fact that I have CBD does not preclude me from having to face many other of life’s challenges as well. And so, the last few weeks have been particularly taxing and draining. I grow tireder and wearier – some I guess from the life issues and some from the disease itself. Yesterday, Sean and I went down to the beachfront to watch the Iron Man contest. I recall being one of a small group of people watching from Hobie Pier the swim commence in the very first Nelson Mandela Spec-Savers Iron Man contest seven years ago. The contest has subsequently grown tremendously and improved significantly. Thousands of people now line the route and get involved in the festivities of the day. As in life, there are those who make use of the opportunities that come their way, those who do not get involved at all and those who find fault in every prospect. Despite the economic benefits for our City and the plain and simple entertainment value of the occasion, there are those who will complain about the road closures and the traffic jams! For the 1745 athletes themselves, there is the challenge of their personal triumph over time, distance and their own bodies as they take on a 3,8km swim, a 180km cycle and then a full marathon of 42,2 km! We watched as local athletes Tissink took the gold (8 hours 5 minutes) and Cunnama the bronze, with German Bocherer taking the silver – all three breaking the previous record time of 8 hours and 17 minutes! 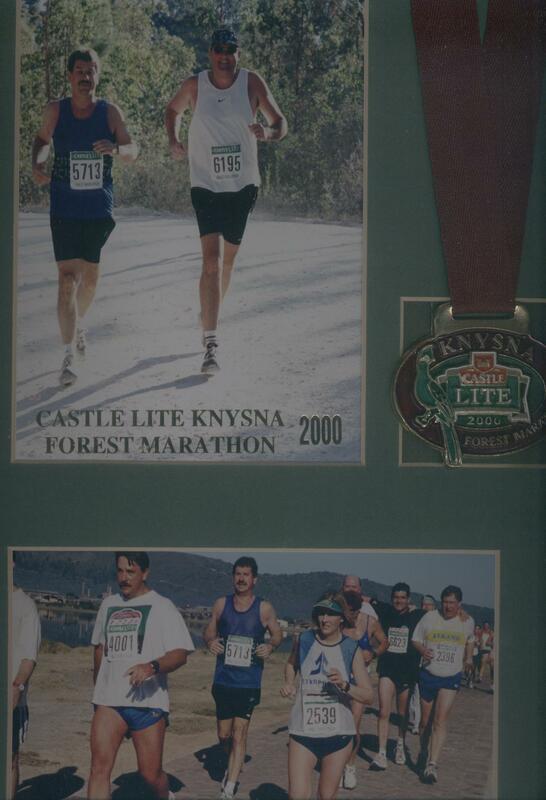 The athletes looked tired and weary as they crossed the winning line one after the other – from 15h00 onwards until the cut-off time at midnight, 17 hours after the start at 07h00! For a moment, I thought of my own race that I run – my body becoming wearier with each additional step that I take. How many more laps do I have to run? How much more time do I have? When will that finishing line appear in front of me and what will be the numerals on that overhead digital clock that constantly counts the time. Some days, I look so forward to seeing that finishing line. But then there are the times when you feel like you can and want to do yet another marathon and a few more laps! Times like Friday night’s Neil Diamond show at the Nelson Mandela Stadium. It brought back memories of Friday night’s Springbok Radio Top 20 and my little brown leather-cased transistor radio with earphone that I used to listen to in bed in darkened bedroom between 10h30 and midnight. There were all those other radio programmes too – Squad Cars, Pick a Box, Mark Saxon – No Place to Hide, Consider Your Verdict, Creaking Door. The list is endless. Those were the pre-TV days and besides my brown Hitachi transistor radio there was the “wireless” in the lounge – the radiogramme with a few orange-lit valves in the back and a green eye in the front that had to light up before it was warm enough to make any sounds! Besides the radio and Springbok’s Top 20, there was the record player that played those heavy black His Master’s Voice records at 70rpm, the 7-singles at 45rpm and the LP’s at 33 and a third RPM – that included my LP of Neil Diamond Hot August Night! You put the record on the silver centre spindle (spindle through hole in centre of record), moved the swing arm to steady the record on top of it, and then pressed the start button. The LP dropped onto the turntable, the arm with the stylus moved over the edge of the record, then descended onto the outer grooves and – voila! – Mr Diamond would start singing in mono sound out of the speaker at the bottom of the ‘gram! When it was announced that Neil Diamond would be singing here in PE, I invited AlgoaFM listeners to apply for two tickets that I sponsored. Their stories are blogged previously. I awarded the tickets to sixteen year old George Marriott of Queenstown, a pupil at Queens’ College. He has an illness called spino cerebellar degeneration and is largely confined to a wheelchair. His parents and sister joined him for the concert, and it was an absolute pleasure meeting them at the concert and getting to know them better at breakfast. 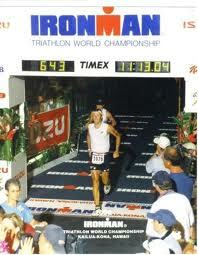 One of the slogans of the Iron Man contest is “ANYTHING IS POSSIBLE”. This is so true when one sees the hardships that so many people have to face on a daily basis. It gives me strength to face yet another lap! And for the two hours that Neil Diamond entertained us, there was not a care in the world. The audience was soaked up into the pleasure of his music and the memories of all his old favourites. Music transports me into another world – it’s almost as if one leaves your own body and enters a realm where the pain and discomfort of the body is felt no more. Those two hours of bliss were no different. It was a hot April night! 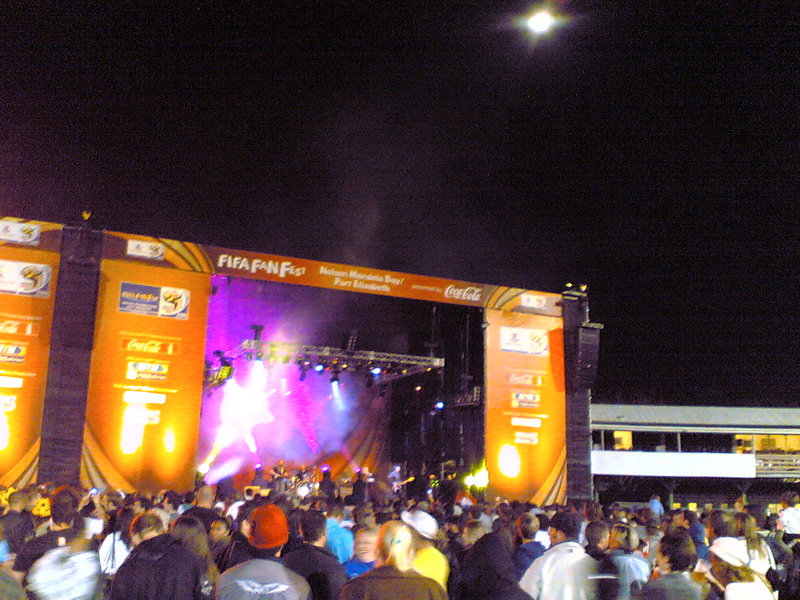 PE laid on its best autumn evening with no wind, the stars shone overhead, the music played and the crowd sang, clapped and danced the night away. What a privilege to have such a stadium, what a privilege to have Mr Diamond in the Friendly City, what a pleasure to hear his music first hand – not through the small 2 inch speaker of the transistor radio or the 10 inch radiogramme speaker, but through the most sophisticated of modern-day electronic equipment. Is it worth what I paid? Will you ever take a chance? Did he know he’d be missed? To finish off a wonderful weekend, our very own modest 26-year old South African Black Diamond, Charl Schwartzel, put it all together to perfection on Sunday evening. He moved up among the leaders after a long chip-in for birdie at the first and a wedge shot from the fairway that dropped in for an eagle on the third hole. He then clinched his triumph with birdies on the last four holes for the thrill of slipping on the green emerald jacket, after winning the 2011 Masters Golf Tournament at the Augusta National Golf Club in Georgia, USA. “It’s a dream for me,” said Schwartzel. Indeed, it was a dream weekend for many! Hell Yeah it was! As Long as there’s Tea, there’s Hope! Saturday 10 July 2010: 3 years 10 months on . . . 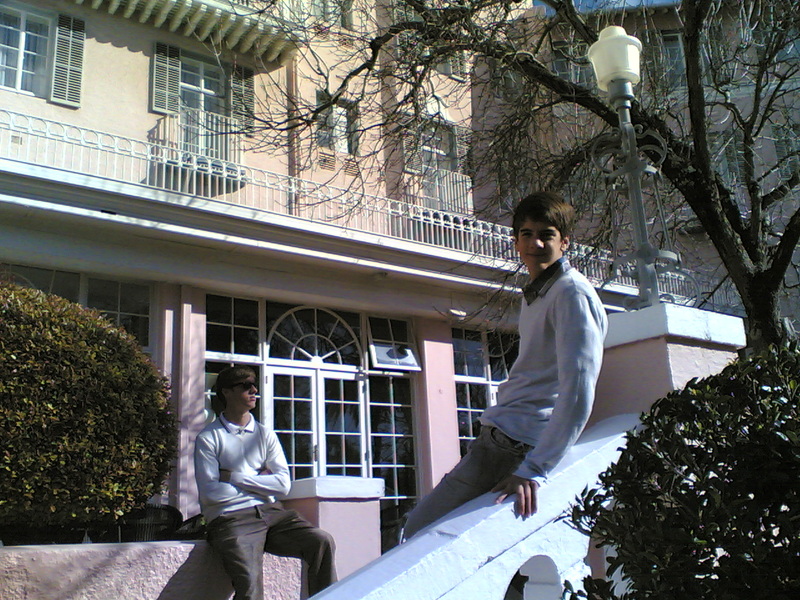 I have previously only visited the Mount Nelson Hotel in Cape Town in the darkness of night. 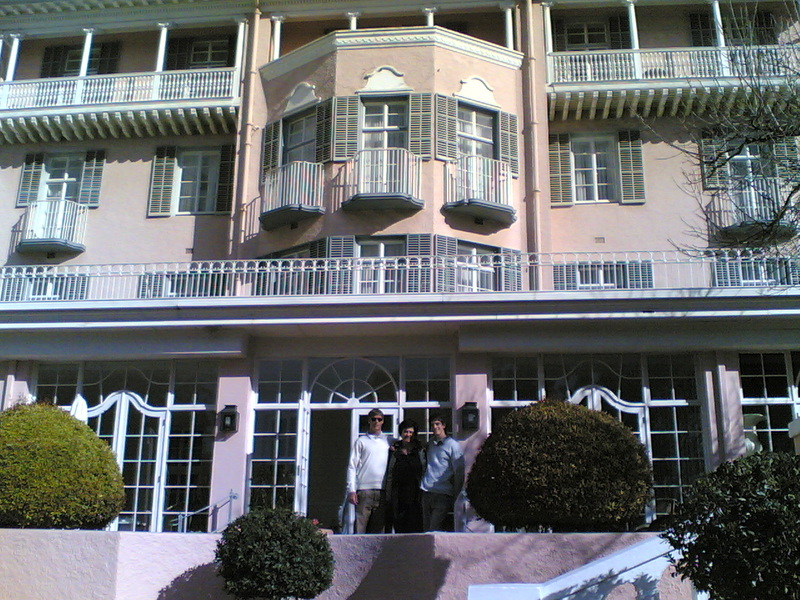 As a Matie, a Stellenbosh University student, I attended a number of formal dinner dances in the Ballroom there, notably the annual Debutantes’ Ball. Thirty years ago, in 1980, as a house committee member of Helshoogte Residence, I also organised a formal residence birthday ball there – complete with the then well-known Hylton Ross Orchestra. Besides academic studies, Maties also become students of dance – the Sakkie Sakkie – disparagingly referred to by English-speaking South Africans by many different terms including that of “windsurfing”! The word “pupil”, used to describe a child who attends a school, was subsequently substituted – by government decree – with the word “learner”. The term “standard ten” – a pupil’s twelfth year at school – has since been replaced with the term “grade 12”. Even a “teacher” has become known as an “Educator”. In fact, despite being repeatedly warned about the folly of their ways, the new government replaced the whole education system that we knew with a new system called Outcomes Based Education (OBE). Last year, they decreed that, once again, we had “teachers”, and, just this last week, have thrown out OBE! And, I guess, couples and dancing are no longer sinful because I see a lot of that – and much more – happening all around me now! But, in an ever-changing world, the Mount Nelson Hotel – known affectionately as The Nellie – still remains. Situated at the base of Table Mountain at the top of Orange Street in Oranjezicht, Cape Town, she is a monument to an era long gone by. And, when you approach her from Orange Street through those imposing tall white pillars and colonnade and see her in the daytime, as we did when we were in Cape Town recently, she is pink from top to toe! We had been invited to High Tea by my niece, Michelle (who helps balance the books there! ), and her husband Sebastian. An institution as old as Nellie herself, High Tea is served every afternoon at two thirty in the Terrace Room. It had snowed on Table Mountain during the previous evening, and it was very cold in Cape Town. A fire was burning in the fireplace and the pianist at the end of the room was tickling away at the ivories – all those haunting melodies from down the ages. 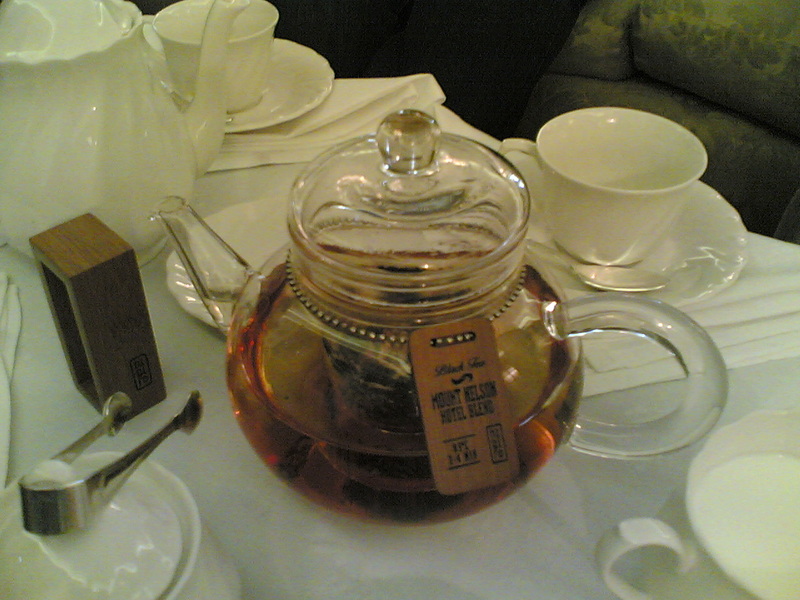 Seated in the comfortable padded high back sofas and couches, our waitress gave us the run-down on the various teas of various tastes and fragrances, all infused in the glass teapots in front of us and poured into the fancy china cups and saucers. And, in between every course of tea (and sometimes during the course of tea and many times more than once in between each course, and before each course, and after each course) we each headed off to the treats table! It was laden with sweets and savouries of every kind and never appeared to empty – from the cucumber and salmon sandwiches through the lemon curd pies to the cheese and strawberry cake and the carrot cake. Thank goodness the treats table was at the other end of the room to where we were seated – at least we were getting some exercise to assist with the digestion of the layer upon layer of decadent delicacies. And, until 5pm, the pianist played and the fire burned, tea was quaffed, eats were eaten, stories were told, some played bridge, some chatted, and people came and went. In 2010, we were reliving that tradition that was one of the reasons for having built Nellie in the first instance – simply a place to enjoy afternoon tea and a treat with family and friends! After tea, Michelle (or should I rather say, Sebastian!) arranged for us to tour the hotel – a home of the rich and famous. We went from the ordinary R7000 a night single hotel rooms through the average R10 000 a night double rooms to the R15000 a night luxury suites, like the one used by actress Charleze Theron (together with the one next door for her Mom) when they are in Cape Town. When you switch it on, the TV rises in a cabinet from the floor at the foot of the bed! Some of the suites, we were told, are booked by regular patrons two at a time for a stay of two or more months. We could only afford an afternoon, so then visited – just to look at – the newly R24 million renovated spa – a row of houses recently acquired that even necessitated the closing of a street by the City of Cape Town. To end off a truly magnificent and memorable afternoon, we had a parting drink in the hotel’s Planet Champagne Bar. We each ordered a cocktail – some specially concocted for the 2010 World Cup. I ordered a Dutch Flower– possibly a good omen as we wait for the final on Sunday between the Dutch and the Spanish? The rest had a Frozen Daiquiri, a Virgin Daiquiri, 1 Golden Goal and 1 Mojito! But, for the adventurous, the menu provides anything from a R17 Castle to a R7999 bottle of Dom Perignon. Thanks, Michelle and Sebastian, for a wonderful treat. Tuesday 29 June 2010: 3 years 9 months on . 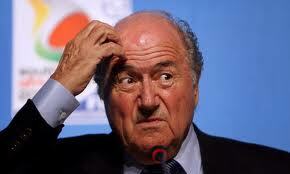 . .
We have also become the WAGS of soccer – not the wives and girlfriends but the watchers and goers! That’s all we have seen and done over the last few weeks. We watched the World Cup opening concert in Orlando Stadium, Johannesburg whilst we were with my sister Lynne in The Strand. We watched the Opening game in Soccer City at the Brazen Head in Stellenbosch. We’ve watched many of the games on TV in Cape Town – and even at the famous Cape Town Waterfront. 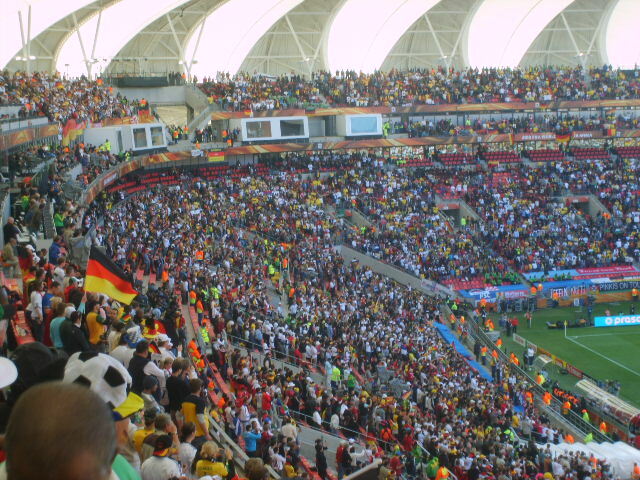 We have gone to see the German / Serbia game at the Nelson Mandela Bay Stadium in Port Elizabeth. 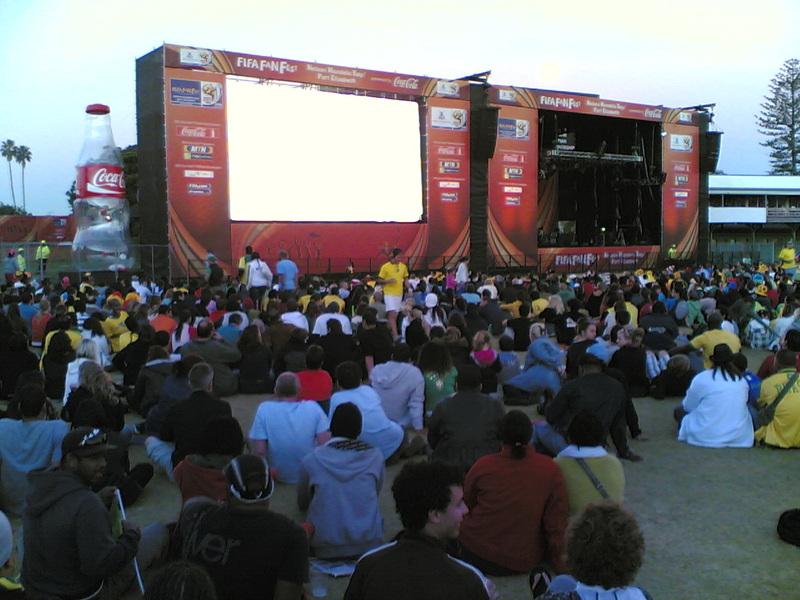 With thousands others, we have gone to the FIFA Fan Park at George’s Park in PE to watch: Bafana Bafana beat France 2 – 1 and then bow out of the tournament, on Wednesday England beat Slovenia 1 – 0 and on Friday, Portugal draw with Brazil 0 – 0! I even watched and listened to Just Ginja at Friday’s Fan Park concert. And, in between all of this, I have watched more football on TV in the past two weeks than I have ever watched in my entire lifetime before! Like so many others worldwide, I have truly got the FehVah! The Football FehVah! But, since returning from Cape Town last weekend, I have also got some other Fehvah! And for the last week, I have felt the worst since I became ill three years and ten months ago. Despite feeling unwell, I have been pushing myself to attend and watch as much football as possible, because it won’t happen again in my lifetime and I don’t want to miss out! And, as I have said to many people, we are going to be paying for this party for many years to come, so we’d better enjoy it while it lasts! And not being cynical, do yourself a favour and get to a Fan Park – you have to experience all the facets of this unbelievable show. When I feel better, I will write about my World Cup lessons in more detail. I have been to see the doctors – again. 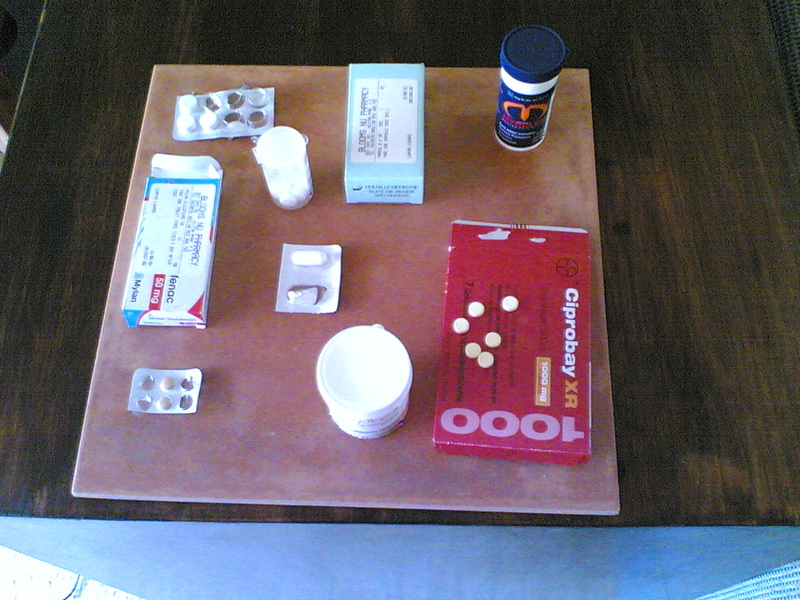 I am taking more tablets – again. I am feeling miserable – again. I have a bladder infection, and whilst this may seem like a pretty ordinary occurrence for most people, in my case, it’s also one of the symptoms of the CBD that I have. As the brain loses control of the body, the bladder also becomes affected, and infections occur. So I have to be careful and can only hope that this will clear up soon. Right now, I am feeling better, but this last week has been a challenge for me. And it’s when you don’t feel well, and don’t sleep well, and feel down and tired, that’s when you have to guard most against becoming depressed. It’s so easy to slip into that whirlpool of self-pity, and to get sucked into that eddy of despair. That’s when I’m ugly and I lose my temper with those around me. And that’s when I am not the first choice person to be around! So? That’s when I have to focus my mind, strengthen my resolve and, once again, look at what I’ve still got, and pull myself back. Thank God for that strength, and for giving me the football at this time to keep focussed on, and to get me out of this. As Banafa Bafana showed us these last two weeks – with focus, determination, effort and resolve, we can all be winners! P.S. I have just heard that my Aunty Irmela passed away this morning. She was the wife of my Uncle George Lunnon, my late father’s eldest brother. (Read The Circle of Life to see our family tree!). My condolences are extended to my cousins Louise, Susan and Hildegarde on the passing of their mother. 2020 Vision – Do I see the Olympic Games? Saturday 26 June 2010: 3 years 9 months on . 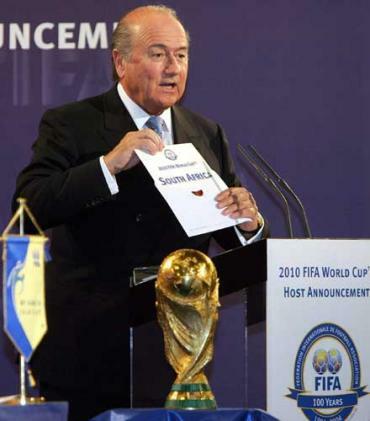 . .
Saturday 15 May 2004: In Berlin, Sepp Blatter announced to the World that the host country for the 2010 FIFA World Cup® would be South Africa. 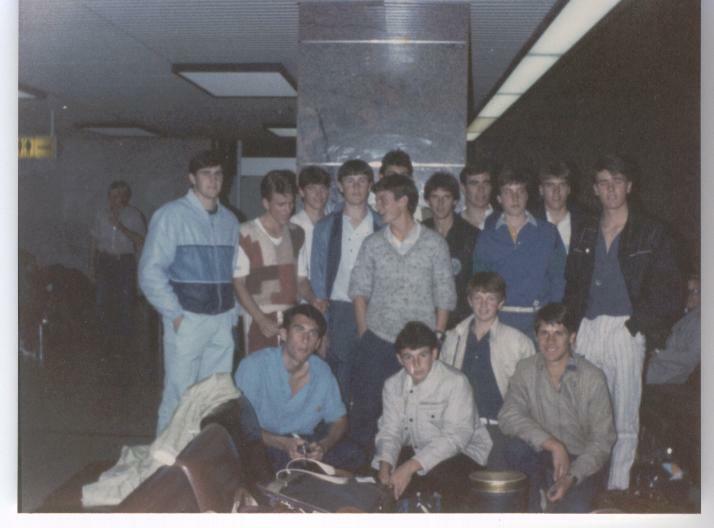 I was sitting in the casualty department at St George’s Hospital with Sean after he had broken his hand playing rugby. We heard the announcement on the radio. It seems difficult now to believe that prior to 1994 we were the pariahs of the world. We were banned from all international events and, I’m not sure how they managed it, but in the early nineties the only international sport we still saw on TV was the Wimbledon Open. The sporting highlight of the year was surely that annual Sunday afternoon when we could get together with our friends and watch the Men’s Final – complete with strawberries and cream! One of the first and immediate changes in the New South Africa was our re-admission to World sport. I remember the poor quality of the TV transmission when watching the first test after re-admission of our cricket tour to India. But, it certainly didn’t matter, because we were back in the World! Looking backwards now, we successfully hosted the ICC Cricket World Cup in 2003 and in 1995, barely a year after South Africa became a fully democratic Republic under President Nelson Mandela, we hosted (and won!) the IRB Rugby World Cup. 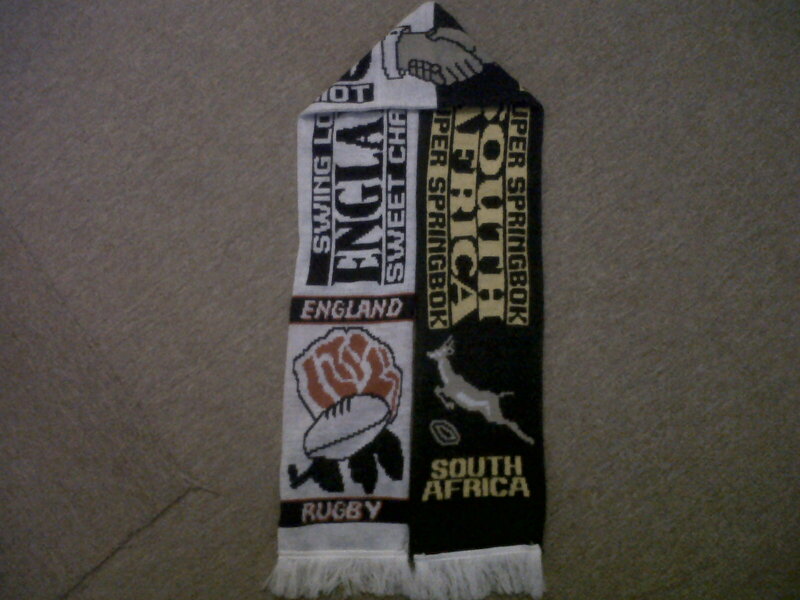 I recall the opening of that event in June 1995 at Newlands in Cape Town, when the Springboks faced and beat Australia. I was working in East London on that Wednesday. At lunchtime, we headed back to the Pick ‘n Pay regional office to watch the game. We experienced the normal after work rush-hour traffic at 14h00 as everyone headed off home or elsewhere to find a TV set to watch that opening victory! 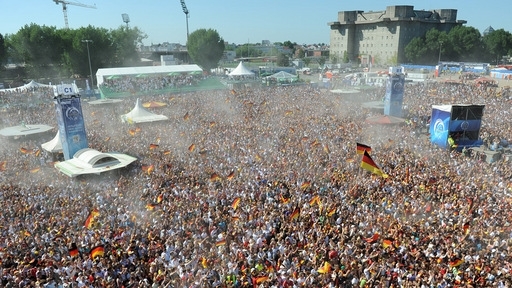 No beers were to be drunk watching the game – after all, it was still working hours! But, as the excitement built over our impending win over Australia, the beers were opened and the partying carried on well into the night. 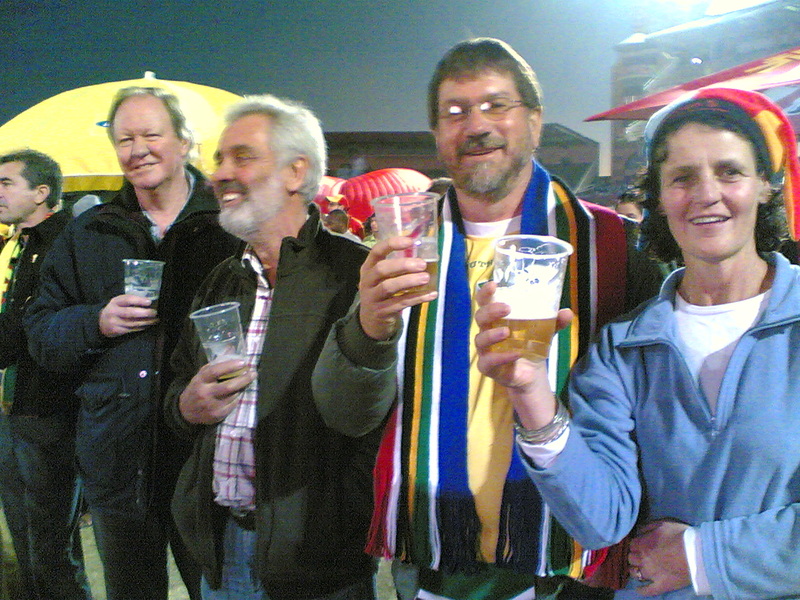 And the partying continued throughout those three weeks – as the Springboks progressed through the tournament via the lights-out, darkened stadium and the Battle of the Boet versus Canada in Port Elizabeth, to the almost rained-out, deluged and helicopter dried semi-final against the French in Durban and into the final against New Zealand’s All Blacks at Ellis Park in Johannesburg on 24 June 1995, 15 years ago almost to the day. We won that game 15 – 12 in extra time and became the World Champions. I have seen THAT photograph of Stransky’s drop goal in every boardroom in South Africa. I have seen the video footage of that spine-chilling Jumbo Jet Boeing 747 flying just above the roof of Ellis Park with “Good luck BOKKE” written on its fuselage. Most people have now read the book Playing the Enemy and seen the movie Invictus (based on the book), which tells the story of that game, the build-up to it and the legacy it left our country. But I have never seen that game! Only because Phillip (at 24 weeks in Pera’s tummy and only due in September) decided on that Saturday morning that he, too, wanted to watch that historic game. But all of this is history now. After I was diagnosed in February 2007, I had often wondered whether I would still be here in 2010 to see any of this World Soccer Championship. 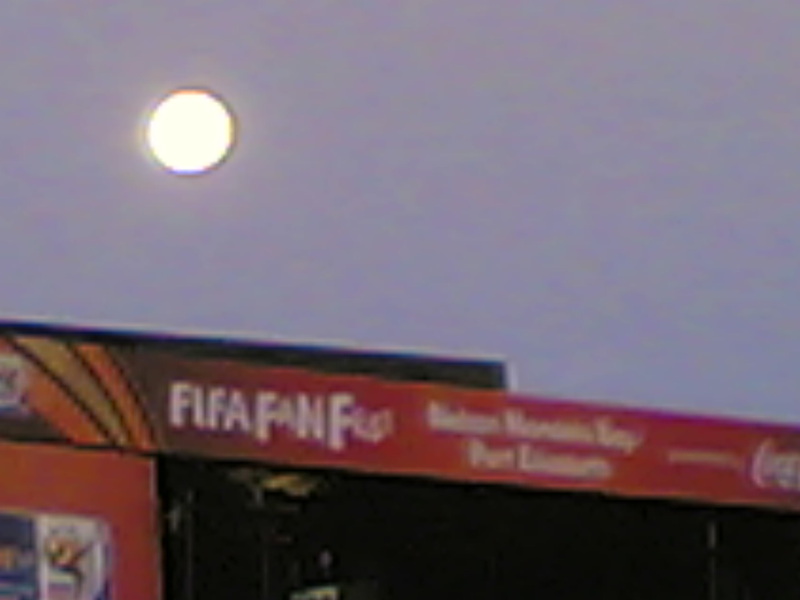 And yes, here we were, Friday 18 June 2010 and we were headed to watch our first live game of the 2010 FIFA World Cup ®. Much has already been written about this spectacle (see my own humble contribution in my previous blogs Oh What A Circus, Ka Nako ,Gees Recipe) and much more will still be written. At this point, suffice to say, that if we thought that the 1995 Rugby World Cup made a positive difference to our fragile democracy, then the legacy that this Tournament is carving into our society, pales that difference into insignificance! The family and Barbara (our domestic help) left home at 10h45 – destination: Port Elizabeth’s magnificent first completed Nelson Mandela Bay Stadium. We were dressed in our Bafana Bafana shirts and colours of yellow and green. 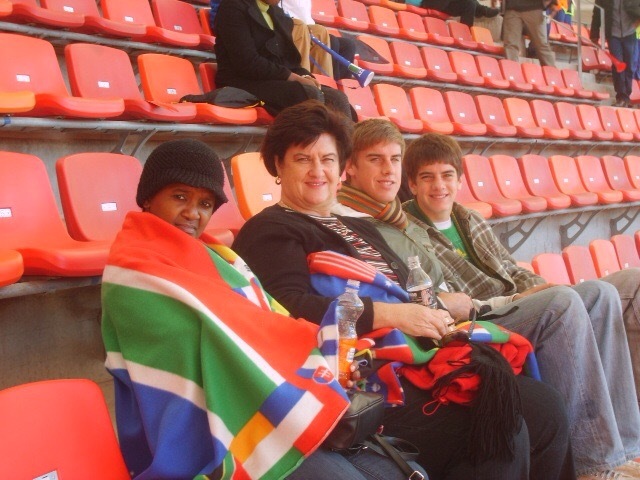 Armed with our rainbow nation coloured blankets, scarves and vuvuselas, we were off to watch Germany beat Serbia (or so we thought!) in game 21 of the tournament. The logistical arrangements were faultless. After parking the car at Andrew Rabie School, we took the appropriately marked Kwela Kwela taxi to North End. Then followed a short walk to the stadium. Extremely courteous staff scrutinised our “cheap” category 3 R560 tickets and searched our bodies. We were of the first spectators to be seated in our 6th tier seats with an amazing view and still two hours to kick-off at 13h30. Even the fact that FIFA was doubling the prices and fleecing the captive spectators at R30 for a Bud, R20 for a pie and R15 for a Coke did not dampen our spirits. 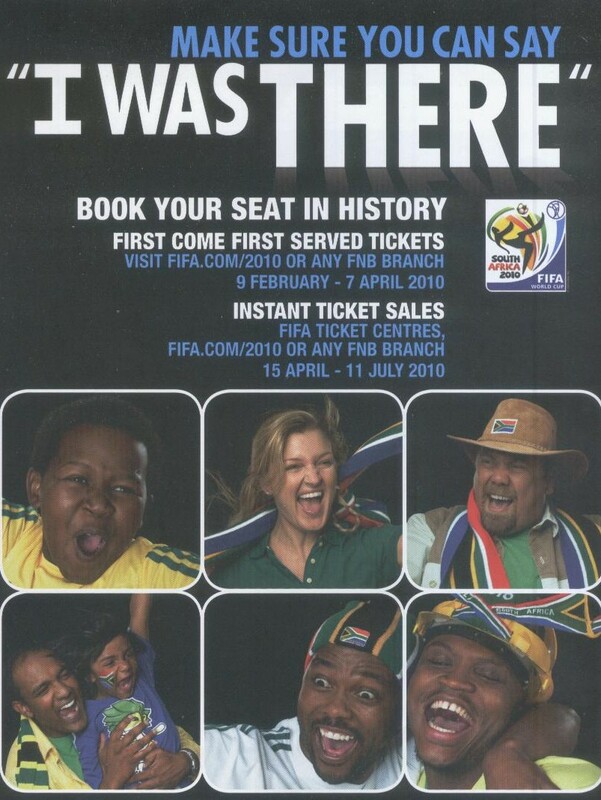 As the advertising campaign had urged us for months now – “We had booked our seats in history”. The turf was watered, the stadium filled with 38 000 spectators, and the two opposing parties inspected the turf and warmed up. Then, with military precision, the teams entered the arena at 13h20, national anthems were sung and the game began! After 90 minutes and a few extra, the excitement of the game was over. Serbia surprised and beat gallant Germany 1 – 0! We left our seats at 15h20 and reversed the procedure we had followed just 5 hours earlier. They drew 2 all! There was no winner here. But, as had been said so many times before in these last two weeks, the winner must surely be the citizens of the enigmatic Republic of South African who have made this miracle possible. They have made Africa proud. They have turned the ordinary into the extra-ordinary! And, as South Africa now sets its vision on hosting the only big games left that it has not yet hosted, those of the Olympic Games of 2020, dare I hope for so much more extra time . . . .?